When you purchase your plus size pattern, one alteration you may have to do is alter your shoulder slope. The shoulder slope is the angle of your shoulder from the base of your neck to your shoulder point. How can you tell if you need to alter your pattern? If you have excess fabric or wrinkles between your shoulder point and the start of your bust, you need to lower your shoulder slope. If your fabric is pulling or straining between your shoulder point and the start of your bust, you need to raise your shoulder slope. Not only do I have sloping shoulders, but they are very narrow. I’m going to show you how I alter my shoulder slope in 7 easy steps in the video below. This is not the only way to alter your shoulder, but I like it because it’s quick and uncomplicated. Tools needed: tape measure, scissors, pencil, ruler, french curve or curved ruler. Leave a comment below if you agree (or disagree) that these 7 steps are an easy way to alter your shoulder slope. Do You Want to Make Your Own Sewing Patterns? This is so helpful. I didn’t realize that the alteration is on the deadline not the cutting line . My pattern is multi-sized and doesn’t have seamlines. What to do? Ruth, you can draw in your stitching lines. Most patterns have 5/8″ seam allowances unless they indicate otherwise. I have learned so much from you regarding patterns and design fits. I’m glad to hear that, Sheena. Thank you for taking the time to comment. I love your videos, thank you for sharing! What is the software you use in these tutorials? Thanks, Toby. I’m using PatternMaster Boutique, Version 5 (they now have version 6) from http://www.wildginger.com. This is great! I have round slouching shoulders and noticed that my shoulder slopes deeper than normal. Is it ok to use these instructions if I bought a blouse and rip off the sleeves? I would have to make the adjustments on the blouse itself. Curtis, it depends on how the blouse is made, but your armhole needs to remain the same measurement or it may be too tight and uncomfortable. Lower your sleeve at the side seam the same amount you take out of the shoulder seam so that it’ll fit back into the armhole without you doing anything to it. If the sleeve is still too big, keep lowering it until it fits. Machine baste it in without cutting anything and try it on. If it’s comfortable and fits correctly, sew it in using a regular stitch and trim the seam allowance. 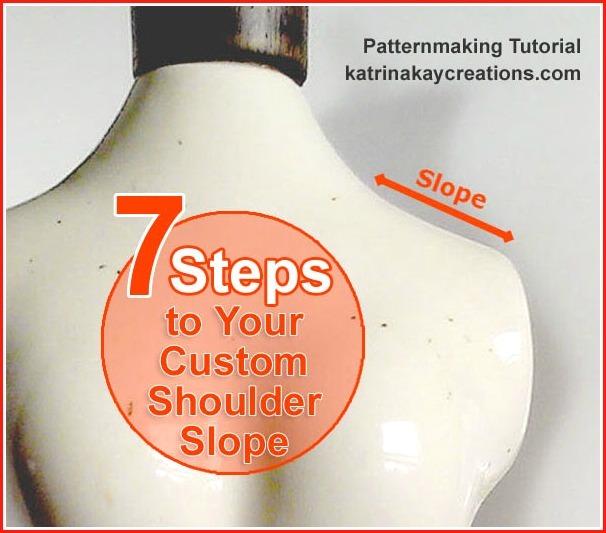 This shoulder slope adjustment can get a little tricky on ready make garments. Ok will tread cautiously. Thanks. I love your new site! I also knew you would be able to do this. I find this instruction very easy to follow. I can not wait to get sewing, My sister and I are moving back to Alabama from New York on the 16th. Sew everything is being pack up. We already have a house to move into and we are going to turn the garage into a sewing room. I’m using this time to study every thing I can get my hands on. I have the books on Sewing for Plus Sizes and Sewing Essentials which is great for beginners. Thank you so much for all that you have done for everyone who visits your site. It’s been a God sent for me. Thanks, Leslie, I’m glad you like the site. I appreciate your patience and encouragement. Wishing you the best on your move. It sounds like you and your sister are going to have a nice sewing space. I’m so glad I could be of help in your sewing journey. Katrina thank you sew much ! Do you have any tutorials on doing a full bust adjustment on a sewing pattern? Thank you! No I don’t, Dara, but I’ve seen many on the Internet. If you google full bust adjustment, a lot tutorials will come up. Hope that helps. I was trying to figure this out on my own and got hopelessly lost. You made this simple and easy to understand. Thank you! You’re welcome, Heidie. I’m glad I could help. Welcome, Sharon! I’m glad you like my site. The best way to measure your front should slope is from your shoulder point diagonally to your center front waist, and your back shoulder slope is measured from you shoulder point diagonally to your center back waist. Measure the same area on your pattern to determine whether you need to lower or raise your shoulder. For women with a very large bustline, my patternmaking software recommends measuring the center front length and adding 3 inches to that measurement for the front shoulder slope. Then add 1/4 inch for square shoulders and subtract 1/4 inch for sloped shoulders. Thank you so much Katrina. I’ll try it out and see how it works. I finally found out the reason I didn’t go to bed and have been surfing all night. It was to find this site! Fabulous!! I started on one pattern and the fabric and pattern are still in a total mess. Patterns are not what they were when I was 18. I’m 62 am so tired of the matronly or college age clothes designed for young senior citizens. I made a skirt without a pattern and was very pleased with myself. But I need your tips to correct things like shoulder slope and curved back. I had no idea these adjustments were available. Thanks for making my life so much easier. You’re very welcome, Maggie. I can relate to being tired of the matronly or college age clothes. There’s a whole group that has been overlooked by the retail and the sewing industry. Thanks for sharing this is what i do too.